At a minimum our goal is to develop a better understanding of Japanese labor market practices and work organization and in so doing develop a more enlightened vision of American practices. We will greatly enhance our ability to achieve both these goals by arriving at a better understanding of the comparative experience of the two nations over time. We can no longer afford the delusion that what exists in the United States reflects the characteristics of industrial society in its most advanced form. Yet to follow current fashion in simply denying that the United States is the very model of a modern society, while advocating that we imitate the Japanese, is to take a course filled with its own pitfalls. Perhaps it is time we accepted the fact that the social scientist’s intense commitment to generalization cannot be allowed to obscure the fundamental observation that nations develop along their own paths, based on their own political, cultural, economic and social histories. As nations industrialize there is undoubtedly convergence in important institutional spheres, such as the expansion of education, the adoption of common technologies and determinants of labor mobility. Certainly nations can learn from one another, and indeed some nations impose their will on other nations. Yet there are also unique solutions to common problems. —From the Introduction This title is part of UC Press's Voices Revived program, which commemorates University of California Press’s mission to seek out and cultivate the brightest minds and give them voice, reach, and impact. Drawing on a backlist dating to 1893, Voices Revived makes high-quality, peer-reviewed scholarship accessible once again using print-on-demand technology. This title was originally published in 1979. 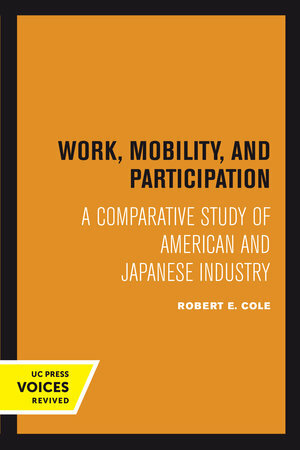 Robert E. Cole is Professor Emeritus of the Haas School of Business and the Department of Sociology at the University of California, Berkeley.